John Kerry says Israel will allow Muslim authorities to install cameras on Temple Mount, and will ensure Jews can't pray. US Secretary of State John Kerry said Saturday that Israel has agreed on steps to calm tensions over the Temple Mount, including 24-hour security cameras, AFP reports. Prime Minister Binyamin Netanyahu was to announce details of the measures later the same day, Kerry said after meetings in Amman with Jordan's King Abdullah II and Palestinian leader Mahmud Abbas. He said Netanyahu had agreed to "an excellent suggestion by King Abdullah", custodian of the Temple Mount complex in Jerusalem, "to provide 24-hour video coverage of all sites" in the compound, which is sacred to both Jews and Muslims. "This will provide comprehensive visibility and transparency and that could really be a game changer in discouraging anybody from disturbing the sanctity of the holy site," he said. 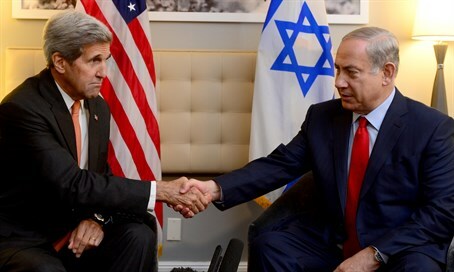 Kerry, who met Netanyahu in Berlin on Thursday, also said the Israeli leader had "reaffirmed Israel's commitment" to upholding the status quo at the site, which stipulates that Jews are allowed to visit during specific times, but forbidden from praying. Palestinian claims that Israel intends to destroy the al-Aqsa Mosque sparked a recent wave of terrorism that has seen knife and gun attacks against Israelis, as well as clashes between Palestinians and Israeli security forces. The talks in Amman came as a Palestinian tried on Saturday to stab an Israeli security guard and was killed, according to police. Netanyahu has repeatedly accused Abbas of fanning the flames by suggesting Israel wants to change the status quo at the Temple Mount. The international community is seeking a halt to a wave of violence that many fear heralds a third Palestinian intifada, or uprising. Kerry, his Russian counterpart Sergei Lavrov, EU foreign policy chief Federica Mogherini and UN Secretary General Ban Ki-moon -- members of the Middle East peacemaking Quartet -- appealed for "maximum restraint" after talks on Friday in Vienna. They also issued a call for Israel to work with Jordan as steward of the Temple Mount.